The T92 is the hardest hitting artillery vehicle in the game, armed with a massive 240mm Howitzer. The damage and splash from this gun is enormous and can cripple any tank it hits, but you don't need to actually hit your target with the amount of splash radius that this gun has. If HE manages to penetrate your target it will most likely be knocked out or very heavily damaged. Armor Piercing rounds are discouraged with this tank as the gun is very inaccurate, but if you manage to land one, it has the ability to one shot tier IX tanks and some Tier X tanks. It also has no gun depression whatsoever, which makes self-defense very hard. 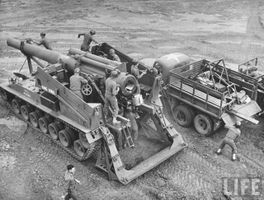 It retains the speed and maneuverability of the M40/M43 which can come in handy in some situations, especially relocation. Most powerful gun in the game with the potential of destroying full-health tanks. Much slower than the M53/M55. Also one of the slower SPG's in general. Before the Great Arty Nerf of patch 8.6, the T92 was a very fun tank. It originally only had a dispersion of 0.62, meaning that even with a miss, the splash would do significant damage. Then 8.6 came along and drove a GIGANTIC nerbat right through the T92, giving it a whooping 0.30 more disperion and nearly sealing it into the coffin. Nevertheless, the T92 is still a powerful vehicle and can be a nasty surprise for any tank in game, but only if the team is good. The T92 will not fail the team if the team knows what to do. With 500 HP, it's important to move to the nearest sizable bush and pre-aim for early scouts. But don't waste your shells. Try to get the scouts to find a good bunch of enemies and shoot them instead. 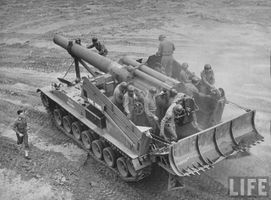 With the inaccuracy of the 240mm howitzer, you'll mostly rely on area splash damage to deal your damage, one tactic that is good for this artillery is zeroing in on a group of tanks and dropping a huge round right into them and damaging them all, allowing your team to take advantage of knocking out several or more damaged and/or tracked tanks. However, your gun can give you away easily, so be sure to relocate immediately after firing or you very well might be the next target. 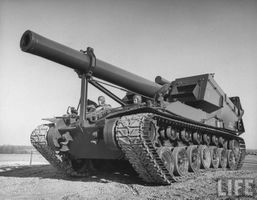 The 240 mm Howitzer Motor Carriage T92 was self-propelled howitzer developed by the United States of America during World War II. 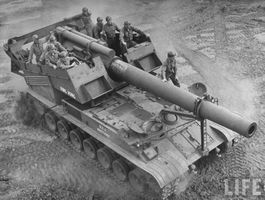 The 240 mm M1 howitzer was mounted on a slightly modified Heavy Tank T26E3 (later the "Heavy Tank M26 Pershing") chassis - it used an extra bogie wheel, to bring a total of seven. A limited production run was ordered in March 1945, and the first test model was finished in July of that year. Total production of the T92 was five. A similar vehicle was also built in conjunction with the T92, the 8in Gun Motor Carriage T93. The T93 mounted the longer 8in M1 gun. Limited numbers of both 240mm HMC T92s and 8in GMC T93s were going to be used in Operation Downfall, the planned invasion of the Japanese mainland. 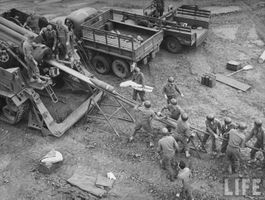 However, after the Japanese surrender on 14 August 1945, the T92s and T93s were not shipped to the Pacific Theater of Operations. 이 문서는 2014년 9월 3일 (수) 17:19에 마지막으로 바뀌었습니다.